Video production, editing, titling by my friends at Candidio. If you need your raw video footage tidied up good, fast, reasonably priced, they are the guys. Jay: Hey everybody, it’s Jay Baer from Convince & Convert, joined today by a very special guest, Mr. David Meerman Scott, author of the bestseller The New Rules of Marketing & PR. David, how are you, good sir? David: Yeah. It’s kind of crazy. I agree with you. It’s kind of crazy. to have been very, very early in seeing the trend. modern business classic. It just sort of worked out. push-back back in ’07 when the first edition came out. out in 25 different languages. best-selling book.” That is truly fantastic. you’re going to do next. Jay: Good counsel. To think about it as you said, you’ve done three revisions of this book, and fewer than five years have elapsed. Jay: The game has changed immeasurably, as I say all the time. Marketing has changed more in the last 5 years than in the 50 years preceding it, and there’s no question about that. It’s crazy, and some of these people who, including us, I wasn’t raised on a computer. All of a sudden, you’re like, ‘What happened? Where was the memo’? All of a sudden, everything that we thought was true isn’t true, and vice versa. David: But the good thing is that you wrote the memo. You and I and people like us are the ones that are writing the memos. We’re the ones that are saying, ‘Here’s how you do this thing’. To me, that’s really, really exciting. I kind of every once in a while say, ‘Wow, how did I end up here? This is kind of cool’. And thanks again to the people who decided they wanted to sack me way back when. David: It’s interesting how quickly it moves. The first edition didn’t include Twitter because it literally didn’t exist. Facebook was only for students when I wrote the first edition. As soon as the book came out, Facebook opened up for people who were not students, who did not have an .edu email address. All of a sudden, the book is obsolete. It comes out, and the next day it’s obsolete. Then the second edition comes out, and all of a sudden things like foursquare and other GPS components that are used for mobile marketing, iPhone apps and stuff, all of a sudden they’re really important for marketing. My second edition hits the shelves, and I’m like, ‘Goddamnit, I’m missing that’. And wouldn’t you know it, practically to the week that the third edition comes out, woo-hoo, we’re finally current. And guess what? Google+. Jay: Exactly. Well, it’s hard because in comparison to blogging or things like that, the time horizon of book publishing is pretty tough. You have to give them a manuscript months, literally months, before the book appears, and months is a long time in our business. So it’s almost impossible. David: Months is a long time. The book officially publishes this week, although it started to ship from Amazon and it was available on Kindle a couple of weeks ago. But Google+ was the first or second week of July or something like that. I forget exactly. Oh great, this wonderful Google+ thing the whole planet is talking about, and this new book that’s supposed to be the bible of online marketing doesn’t even include it. Jay: You can’t win them all. That’s why you’ve got to have a fourth edition. David: You know what? Now, it’s going to be every two years in August. I’ve got a cycle, and the reason for August is really important. It’s because again, I’m dumbfounded that the book is used in literally hundreds, approaching 1,000 different universities around the world as a textbook, and they’re on the cycle. The U.S. academic cycle begins in early September, so having a new edition come out every other year for the academic cycle means it comes out in August. So I’m now on a regular cycle to have it come out every other August for the reason of that academic cycle. Because there’s always pressures to be in more places, do you feel like the new rules are easier to follow for big businesses or for small businesses? David: That’s an interesting question. I actually think it’s easier for small, just because they have more willingness to implement them, and they have less people with the baggage of what “old marketing”. . . I shouldn’t say “old marketing.” I don’t want to imply that things that are offline are old, or things that are offline are wrong. They’re not. It’s totally cool to do television commercials if they work for you. It’s totally cool to have yellow page ads if they work for you. There’s nothing wrong with any of that. But if they’re not working, you shouldn’t have them. I’m not implying that it’s either/or. I’ve found that small businesses, entrepreneurial organizations, start-ups generally have a heck of a lot easier time implementing the ideas because they carry less baggage than some of the bigger companies do. Jay: What’s one of your favorite new stories that you included in this version? David: In this version? One of my favorite stories these days is a story . . . it’s about real-time, too, because I’m a big fan of real-time. 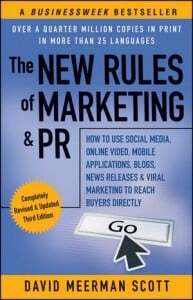 I had a book come out on that topic, Real-Time Marketing and PR. Jay: They have to think about it, and how are we going to handle this, and hem and haw. David: And let’s run it by the agencies, and let’s get the approvals. Let’s make sure. Let’s be careful, and let’s edit, and all that stuff. It worked because it was real-time. It worked because it was thoughtful information. It was content, and it was valuable information. Bang! They put it out there. And again, I’m just dumbfounded at one blog post and a million dollars in revenue. I’d love to have one of those blog posts. Jay: No kidding, right? I’m writing three a week, and I still don’t have a million dollars in revenue from any of them. David: The ones I’m writing are worth a dollar apiece. Sooner or later, we’ll get there. Jay: That’s fantastic. You mentioned blogging, both in that example and when we first started talking. Blogging pays so many dividends on the marketing side, from a storytelling perspective, from a search engine optimization perspective, from a humanization perspective, but yet all of the studies that you see show that still there’s a lot of companies in every category that still are not blogging. Why is that? Why are people not understanding that this is probably, if you had to pick a way to spend your time, whether it’s Facebook, Twitter or something else, blogging is probably the most efficient use of your time. David: Partly I think it’s that people already have a preconceived notion of what blogging is. I think we, the group of people like you and me that advise companies on this stuff, we have some semantic problems. One semantic problem is the term “blogging.” It just feels frivolous. So I think we have a semantic problem, and I think it’s partly the word ‘blogging’ and partly the term ‘social media’. People already think that they know what that means, and they dismiss it. If you talk about the very same thing but in different language, it becomes different. It becomes more real, more interesting. I’ve noticed this many times. You ask someone, “Hey, do you read blogs?” A lot of people just say, “No, I don’t read blogs. I don’t have time to read blogs.” Yet everyone goes to search engines. You and I know, based I’m sure on your search results for your content and your blog and mine certainly, I’m getting hundreds and hundreds of hits from Google every single day on my blog. I know for a fact that many of the people who are hitting my blog with search engines would be the same people that would tell me they don’t read blogs. Jay: Right. That really is an excellent point, and in social media in particular, it’s a difficult phrase because it’s become a catch-all for so many things, whether it’s location or video or content marketing. Everybody just calls it “social media,” and so it’s lost all explanatory or descriptive value in large measure, which makes it hard. I’m delighted that the third edition is out. Probably as soon as this video comes out, it will be out. So we’ll make sure we link that up. It is The New Rules of Marketing & PR. David Meerman Scott joins us. Thanks so much for your time, as always. David: Thanks so much, Jay. I really appreciate it. It was really fun talking to you.